Top Gun is now 100% fully mobile as we will be traveling with mobile lodging. Over the past 15 years of spring hunting the hunting pressure has doubled to say the least. They are also shifting feeding habits in each of the locations we hunt. So we have adapted again as we always do at Top Gun! We are currently booking for our South Dakota spring snow goose hunting season. As always we will have the same great crew, decoys, blinds, land, and locations. We have cabins available and a main lodge in Mound City and Devils Lake locations. All other locations are duck lodges, pheasant lodges, or hotel. Everything after that is up to the birds. Hope to see you in the field this spring to watch the greatest migration of birds on earth. Dates overlap due to the unknown at the beginning and end of each hunt location. We have been able to keep our rates low while improve our service every year that we have been in business. You will benefit from 15 years of experience and a fully established outfitter that is well financed with land and gear. We guide for 9 months of the year. Our customers at Top Gun are 85% return customers. We provide land (15 years of farmer relations in the spring and fall), scouts, 14 guides, and we also travel out of 5th wheel travel trailers ourselves so we are always on the migration. No plugs are required for shotguns in any of these hunt locations and all states we guide in do not have a daily limit or possession limit. Take advantage of hunting with a well financed outfitter that is fully established with Deadly Decoys with unique custom 3 foot stainless steel stakes and back supports, HS Hitman blinds with snow covers, and one of kind durable electronic calls (designed by us and not offered to the public). Plus 15 years of farmers relations in the central and Mississippi flyways. Let your hard earned money go to the aspects of the hunt that matter like land, "the right equipment", scouting, electronics, and hard working experienced guides. Not wasted on gimmicks or trial and error on "what is effective to decoy snow geese"
This will be our 15th season of the South Dakota spring snow goose hunting season. A lot has changed and we have adapted! We offer any type of spring hunt that you would prefer. We hunt in various locations with all types of equipment that have proven to be effective to decoy snow geese. We have a total of eight decoy spreads that we constantly move (if needed)and hunt on a daily basis. We have eliminated any equipment that we feel is not effective and a waste of valuable time. We know that our time concealing and fixing the decoy spread is much more important. Some days all the sets are full of hunters and some days only a few will be full. Either way we have plenty full time guides and full time spotters and decoy setters. This ensures plenty of help if there is a solid snow line and birds stop moving north. The birds start feeding habits in the area and we will be able to target them better and move on them where they feed. These fields will be set at night or midday. When there isn't a snow line we keep our decoys set in the prime migratory funnels that the birds use each year. These are only learned by hunting these fields for the last ten years. This is when you really benefit from experienced guides. In the spring you will not always benefit from hunting scouted feeder birds as those birds can feed in a field in the morning in Missouri and feed in another field in South Dakota that afternoon. Some fields will be set the day we get there and can shoot great averages for the entire two or three week time frame. If they dry up and stop killing birds we simply move them into another funnel or "Killing Field" as we call them. These are fields that may not ever had a bird feeding in but we know year after year when we put our decoys in it we slaughter them! Chasing an "X" field can sometimes be like chasing your tail. In the spring birds feed a lot different than in the fall. The biggest shoots on snow geese will happen from a pushback of geese from the north or migratory birds from the south on sunny south wind days. These days will always outshoot hunting feeder birds in an "X" field. On these days make sure you are in the field hunting with a lot of shells and not moving decoys or chasing feeder birds. In either scenario we will work hard to put you in funnels or feeder fields. When you arrive we will give you our game plan as it pertains to the bird patterns and activity in the area. 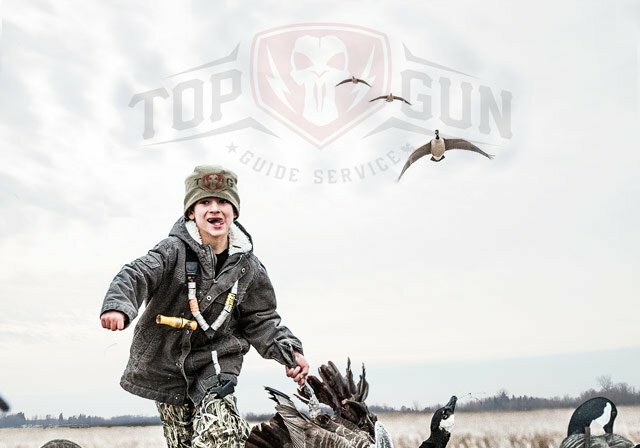 Top Gun wants our customers to have the most enjoyable hunt possible while hunting snows. Weather and snow geese combined can be one of the most predictable and unpredictable hunt you will ever experience. 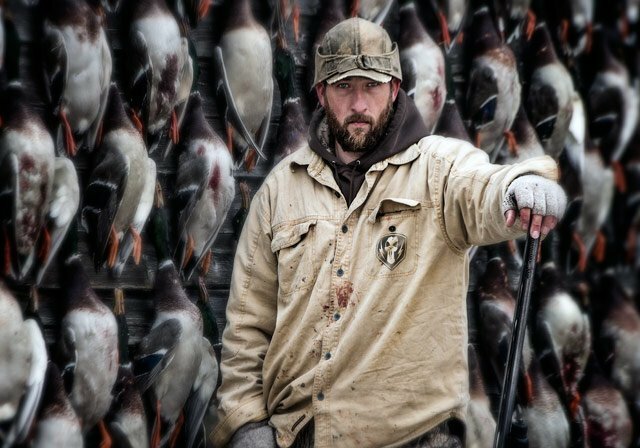 Unpredictable always doesn't refer to bad hunting as it can be some of the greatest waterfowl hunting you will ever see on an day to day or even hour to hour basis . I personally am proud to have watched these birds migrate each spring as it is the greatest migration of birds on earth!! We start spring snow goose hunting in Arkansas, Mound City, Missouri or Kansas in late January and hunt until March 20th depending on the weather and the snow goose migration. We travel with the snow geese, moving into central Nebraska, arriving in South Dakota around March 20th. We hunt North Dakota from April 10th to May 6th. We finish the spring snow goose hunting season in Saskatchewan from May 1st to May 15th. We have land leases in all these areas as we hunt in these areas in the spring and fall. We have been finding these areas and following bird patterns for years that gives a head start on the competition new to these locations. Each snow goose hunt consists of hunting behind 1500-2500 snow goose decoys (Deadly Decoys), electronic callers, we try hunt 6 to 10 hunters max per field depending on how the group numbers calculate. We hunt out HS Hitman blinds (with snow covers in case of snow) We will work with each group to make the hunt work. Dogs are allowed only in an exclusive groups. (6 to 8) We do not allow them in mixed parties. Hunters will benefit from dedicated South Dakota snow goose hunting guides who scout fields daily and are willing to relocate in an effort to stay on top of feeding and migrating snows. We have a young energetic staff of snow goose hunting bloody 70 days that not many guides can finish. We all work together and have a system that has been proven year after year and we have the client base to prove it. When the snows leave overnight we are able to do the same and be on birds the next afternoon. As a client we expect the same of you because sometimes we have to jump from one state to another on a days notice. This is for your benefit. We scout daily in the area we are hunting and we scout the next state we will be jumping to when the geese migrate north. We do everything in our power to get you on birds daily. Once you arrive in South Dakota call us and we will make arrangements to meet you. My guides have proven to have the stamina and knowledge to put you on birds throughout the entire 70 day season. This is a grueling, muddy, and bloody season. We have cabins available and a main lodge in Mound City, Saskatchewan, and Devils Lake locations. Nebraska, Arkansas, South Dakota, and Central Missouri are duck lodges, pheasant lodges, or hotels that we arrange for you.